In the Scout Movement, pioneering is the art of using ropes and wooden spars joined by lashings and knots to create a structure. Pioneering can be used for constructing small items such as camp gadgets up to larger structures such as bridges and towers. These may be recreational, decorative, or functional. Pioneering is used to teach practical skills, teamwork and problem solving. It is widely used in Scouting and Girl Guiding. Many Scout and Guide groups train their members in pioneering skills and construct projects, both small and large. In camp, Scouts may construct functional items like tables, camp dressers and gadgets, as well as decorative camp gateways. Pioneering is a common merit badge in many countries, and was required for the Eagle Scout rank in the 1920s and 1930s. AnimatedKnots.com is a great resource to learn how to do knots, lashings, splices and whippings. 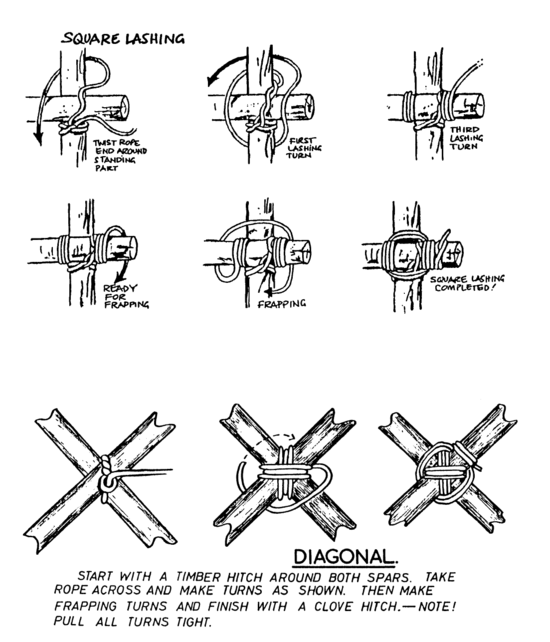 The six basic knots and hitches for Scouts are: Reef knot, Sheepshank, Bowline, Clove hitch, Sheetbend, Round turn and two half-hitches. Different types of rope (hawser-laid, shroud-laid and cable laid), and how to store and care for them. Splices are used to join any two parts of rope together permanently. This document explains the Back splice, Eye splice, Short splice and Docker splice. For larger projects, you will often need to anchor your project, and use Block and Tackle to lift or maintain tension. A diagram showing ways of rigging a block/tackle with their names.